It’s hard to stay productive when your team is all over the place. Without a solution in place to help nail down a solid task list and prioritize, no one will know who is supposed to be working on what, and when. Teams that stay organized are able to stay productive. Of course since a problem existed, the need for a digital project management or team collaboration tool, the solution was born. For years now, Basecamp has remained an incredibly popular choice for many teams. The solution has gone through a number of updates and changes, but overall the concept remains the same. What Basecamp does, it does well, by providing teams an easy and simple solution to track their tasks and nothing more. Simplicity and laser-focus can be a good thing, allowing the solution to solve one problem and solve it well. But, there comes a point when teams outgrow simple solutions, or just a few extra features to get the job done. And so where Basecamp lacks, many alternative solutions have risen to shine. 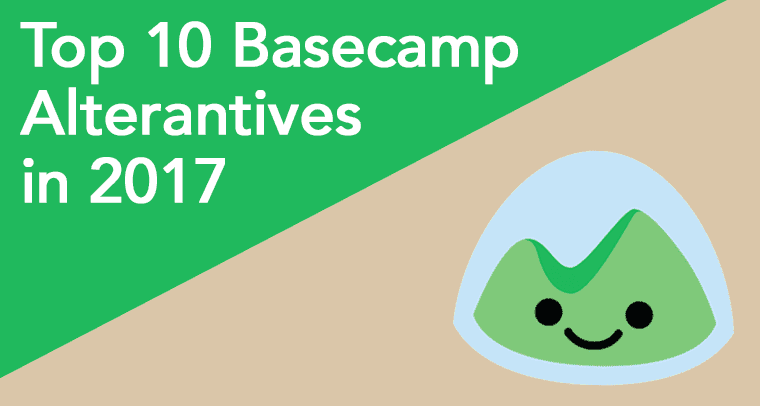 We wanted to take a look at those alternatives and help determine which Basecamp alternative would offer the best solution for your team. And while not a major part of the team collaboration trends we predicted for 2017, project management is probably one of the first tools your team should look to adopt. When comparing other solutions, it’s important to start at the beginning — we need a basis to compare with. So since Basecamp is the standard we will be building off of, we wanted to highlight the key functions and features users have grown to love. Because Basecamp does its job well, and it does help many teams stay organized and productive, don’t think of Basecamp as a Slack alternative, but rather a new solution that can compliment a messaging app like Slack. 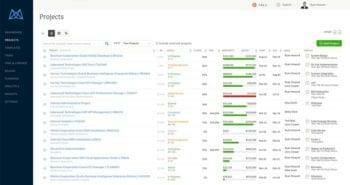 Essentially, all Basecamp really does is provide users with an organizable “To-Do” list. Basecamp can be broken down into different sections, and you can have different teams living in these different sections. Then inside each section, users can create multiple task list topics or sections. From there, invite your team, fill your task lists with tasks, and get to work. Users can open each task and find an in-line comment section to share thoughts, updates, images or files. Other than that, Basecamp just builds in some extra features around their list approach. A simplistic, minimalist and basic design and user experience approach. A platform to create simple, easy list based task management without much effort. Users can assign tasks and due dates to tasks. So if Basecamp does its job well, then why is there a need for a replacement? Well, as I said before, Basecamp is a very simple approach. Simple is good when simple is all you need. But simple also doesn’t cut it when your team is running into brick walls, or the platform is just flat out missing features it otherwise should have. At the end of the day, this is much the case with Basecamp. Even after some maturity, the platform is missing some basic functionality and features users have come to need. Sure, you can utilize integrations to build the specific tool you need, but that can be seen as putting a Band-Aid on the problem to many. While simple, Basecamp offers a limited approach. The platform only uses simple task lists and in-line comments. This can become cluttered fast. Basecamp lacks support for adding in sub-tasks. This can be important because sometimes a big task needs to be broken into many smaller tasks to help stay organized and properly track progress. A lack of expected features for a more in-depth solution. For example, Basecamp is missing analytics, it can be difficult to look up previous tasks, or specifically filter what was completed in specific time frames. Basecamp doesn’t have a simple and easy way to track the time spent on a specific task, or provide estimates to compare actual time to completion to. Real-time communications. Basecamp’s chat is just another silo of communication, with email style in-line comments everything is separate from your other communications. There is no one perfect solution. What one solution or app excels at, another will easily fail at. And it would be almost impossible to develop a one-size-fits-all solution that hits every single point for every team. Since every team is different, works differently, and needs a different solution, you will always find drawbacks with any solution. On one hand, that’s why integrations exist, and you can probably build the “right” solution for your team. But in reality, that’s just not plausible for most teams — those that just need a solution, need it as soon as possible, and don’t want to shell out massive monthly payments for it. Starting with one of the biggest names out there, we took a look at Trello. The solution was recently snatched up by another collaboration giant, Atlassian. According to the acquisition, Atlassian said Trello has about 19 million users so they must have been doing something right. Taking a closer look at the solution, it offers a different take form Basecamp. Trello even sports a powerful notification system to let you know when something is due soon, was added, or completed. In comparison, Basecamp relies on old-school emails for notifications. 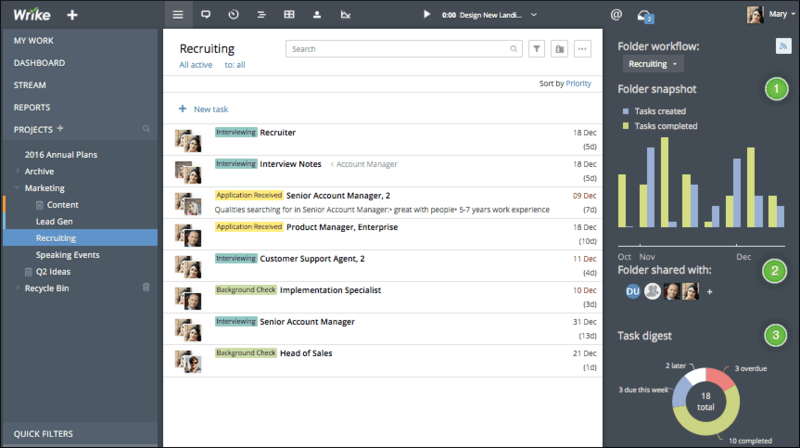 Since Trello was bought by Atlassian, the platform has recently been expanded to integrate deeply with solutions like JIRA and the provider’s Slack alternative, HipChat (although HipChat came first) among other third-party integrations including Slack. 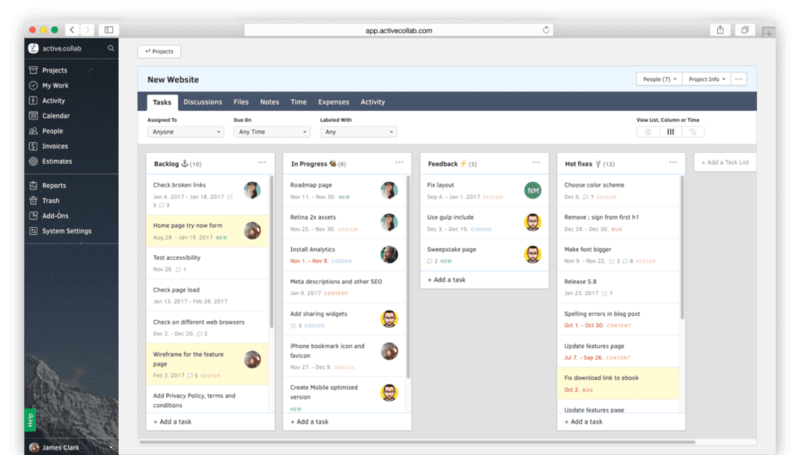 But the real power of Trello is the visual-first format that allows for easier, and deeper organization beyond a simple text-based to-do list. Still focusing on the bigger names, Asana is another widely used alternative. 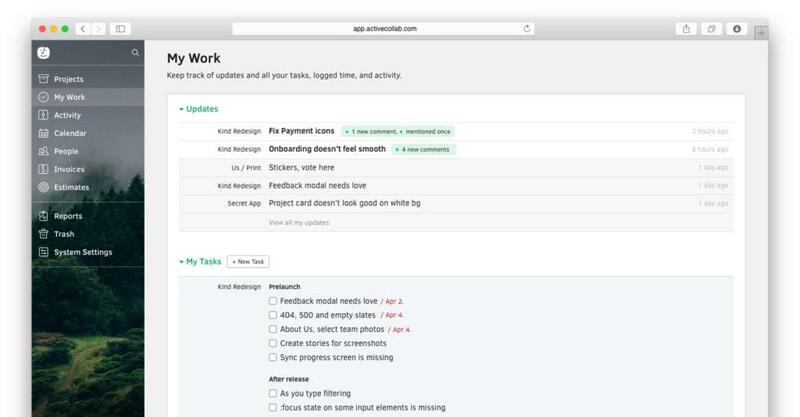 Asana seems to combine both a visual, and list-based approach to the problem of organization. With the ability to start either big Projects, or simple Tasks, Asana helps users organize based on size and priority. Simple task lists, like Basecamp, can be used to assign the quick stuff to teammates. But taking it a step further, task lists can also be organized into Projects where users can share even more information like lists, files, meetings or whatever. This immediately solves the issue allowing users to create subtasks and organize beyond simple lists – even though Asana also specifically sports a subtask function to break tasks into smaller parts to divide the work. But Asana packs even more features, such as sections and columns to customize the platform to match your teams specific workflows and add more structure to their organization. Beyond that, users can also assign due dates and track progress based on time or share attachments. But beyond the organization, Asana allows for deeper communication with task conversations, project conversations, and even Team Pages. 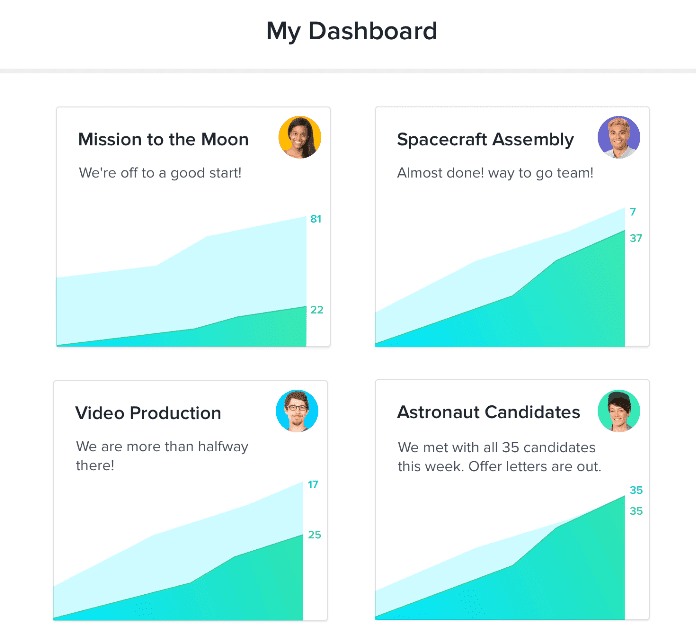 Other unique features include dashboards to check progress on projects with visual guides like charts and graphs, or the ability to follow and receive notifications only the projects that are important to you and your team. 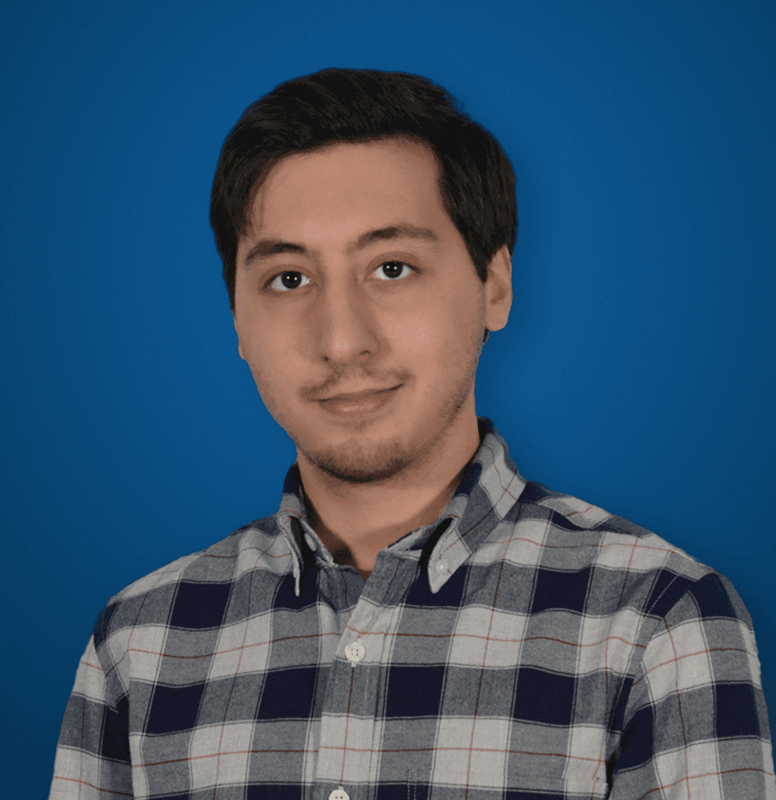 Overall, Asana offers deep organization in both a text based or visual format, with the necessary powerful features like analytics and deep communication to move beyond the simplicity of Basecamp. If your team needs everything under one roof, Zoho Projects might be right up your alley. Zoho manages to hit multiple points, from the simplistic to-do list, up to some really intense features like a Bug List for developers. Overall, the platform doesn’t just include new features, it includes entirely new product and solution categories in the same app. 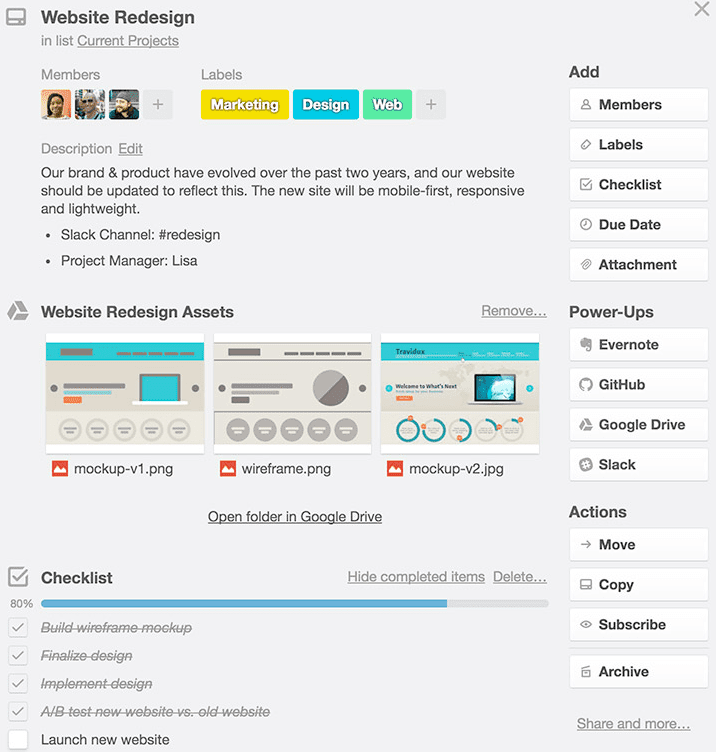 Starting with the Portal, your team’s entire section, users can create Projects and tasks within those projects. Creating a project allows you to view the dashboard, which reports the most up-to-date information about that project — for example, what tasks are being worked on, completed or added add in your team. But there is also a Feed section to find out everything you need to know as soon as you log into Zoho. You can post right to he feed as well to gain feedback from your team, who can comment right in their feed. Beyond simple Projects and Tasks, teams can setup Milestones for their projects as well to track the progress and establish those crucial aspects in the project’s development. Zoho also includes some really powerful functions that expand beyond simple project management. Users can access to a Task section for that standard task-list, but also other sections including Calendar, Documents, Time-Sheet, Forums, Pages, Chat and even a Bug List. These dedicated sections of course help users stay organized in more than just their task management, and can even remove the need for a third party chat app. Zoho also packs some powerful features to stay organized, such as reporting tools, Gantt charts, project coordinator and manager roles, timesheet software and a bug tracking solution. Overall, Zoho is almost on the exact opposite end of the spectrum to Basecamp. Zoho has that jack of all trades approach as opposed to the simple laser focus of Basecamp. There’s a big cross-over between project management and collaboration. 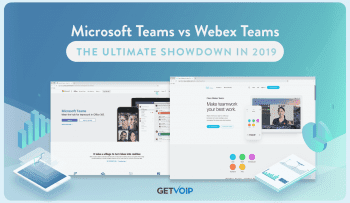 Wrike focuses on that cross over in their solution, aiming to remove the technology barrier so teams can focus on their projects, tasks and collaboration. The major benefit of Wrike seems to be its very easy and small barrier to entry. Just like Basecamp, which is simple and easy to understand, Wrike also provides a simple setup that can be up and running in minutes. Except, where Basecamp just leaves it as a basic list with other tools you’d have to bring in, Wrike does more from the beginning. 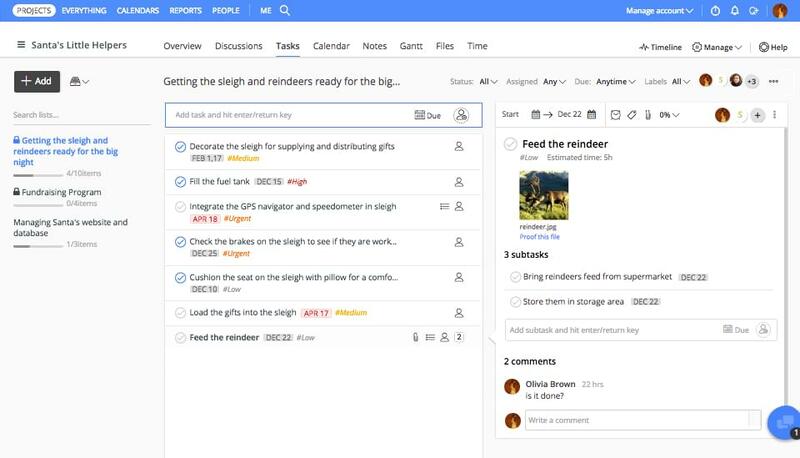 So while Wrike does allow for intense task management, it also allows for on-going project and work management so users can keep going back to a project or resource without having to cross it off, or clutter up, their task list.Just like other solutions, Wrike lets you start a project and filter in all of your tasks and assign those tasks with deadlines to the right team. Wrike also allows for comments and files to be shared on tasks. But as I said before with long term project management, Wrike also lets users setup Folders which can also have Subfolders. These can house your very long term goals or general work, like social media posting templates. More powerful features from Wrike include time estimates of task completion along with time tracking, and users can also set dependencies to link multiple tasks together. All your results can be tracked and organized into Gantt charts for that extra analytics boost. Speaking of all results, users also can have their own dedicated “My Projects” section, or glance at their activity stream to see who is doing what. Overall, the experience is still focused on lists and activity feeds, but the features on organization are far more powerful than what Basecamp can offer. Originally built as a conversation-based collaboration tool, Glip does everything you would need for your work and collaboration in one app. We originally went hands-on and compared Glip to Slack, and I ended up really enjoying the solution. Glip doesn’t use an activity stream or dashboard, but rather has a main focus on the conversational aspect, with all of the extra tools you would need to stay organized and productive thrown in. 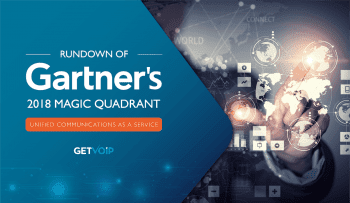 This means that persistent, cloud based and searchable instant messaging is a given. But when it comes to our focus, Glip also provides its own task management tool that will directly integrate with a shared calendar amongst your team. 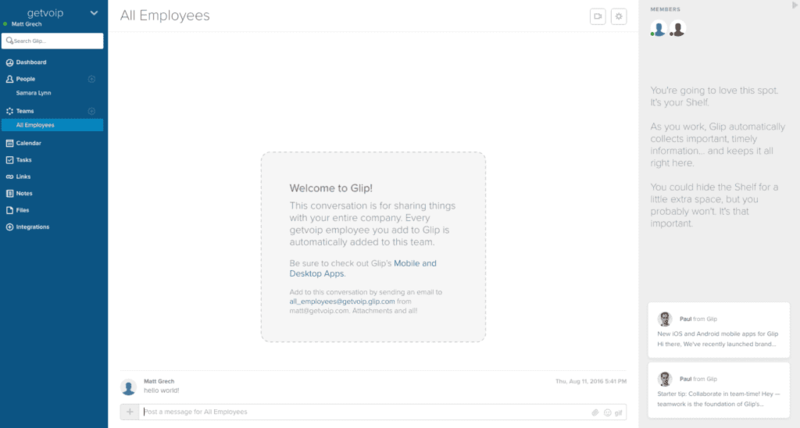 Glip is all about context surrounding your conversations. This provides the ability to collaborate on documents with an “audit trail” to keep track of every change made. On top of it, an independent space for shared files helps keep track of every document that gets uploaded, downloaded, changed and moved around. Although it’s conversation focused first, Glip still packs the tools you need to manage projects and tasks, and manages to include more than Basecamp. Inside Glip, users can create teams, and then within teams create Projects to track long-lasting progress with subtasks, or simply assign tasks in a list based format as they pop up. But tasks aren’t that basic, users can assign tasks, set start dates, due dates or times, attach files, assign colors for organization, and even specify how and when the task will be marked as complete. 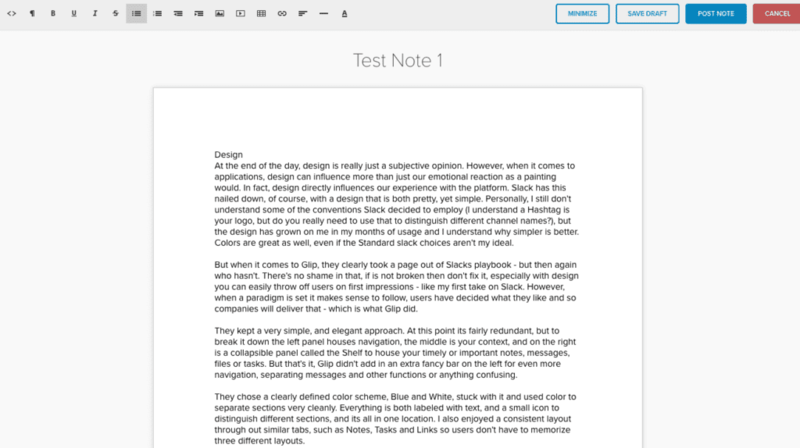 Glip even lets you create notes to work on and edit projects inside the app. But back to task management: users can even mark tasks as a % completed to help track progress over time. Projects are the overarching goals to accomplish, while tasks can act as the specific work points in that project, or other tasks that arise independently. 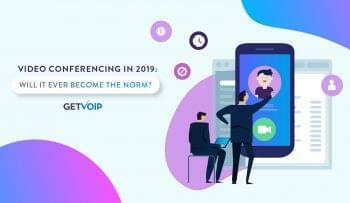 Glip offers both the intense level of organization, with the powerful features teams need, all while wrapped around a powerful chat and collaboration platform. While ProofHub isn’t as well known as some other names on our list, the solution is still a strong contender. With a collaboration and management focus, ProofHub is all about the tools needed to get work done, and understand where any roadblocks popped up. Users can of course track their tasks, but more importantly tasks can be broken into subtasks, and users can track the time spent on tasks. Proofhub even lets users set time estimates on their tasks, so a big one up above Basecamp so far for the crucial missing features. Of course, ProofHub also includes the more powerful reporting features as well behind time tracking. Gantt charts and other logs are included for the visual aid, but managers can also setup or request reports to show the status of a project and how resources are being utilized for that project. This leads into some powerful admin features for managers to take any actions required to help the task stay focused. Other useful features like the inclusion of a Calendar help track everything visually and chronologically, and notes let users save any articles, press releases or just notes they need to take during a meeting. If your team is looking for a simple solution, but not something as simple as Basecamp, Active.Collab at least positions themselves as a simple solution. But when it comes down to it, the solution really is simple – if anything Active.Collab can be seen as a beefed up, standalone version of Basecamp. Task management is mostly care of through a text based to-do format like on Basecamp, but beyond that users can filter out their tasks to find what they want, or organize lists and filter them by assigned teams or due dates. However, Active.Collab is actually able to “adapt to your workflow,” as they put it themselves. Beyond a simple list, can choose to utilize Gantt timelines, or Kanban cards organized in columns. So where Basecamp stops at a list, Active.Collab adds on some of the same features we’ve seen in other solutions and gives users the option to choose. 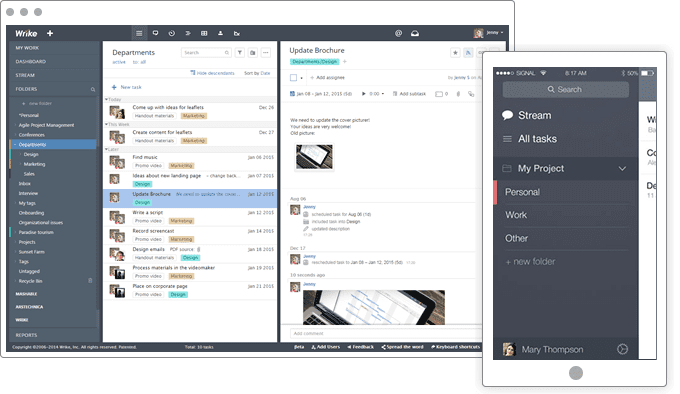 Team collaboration functions are handled through the all-in-one team calendar, and the persistent cloud-based chat. In fact, Active.Collab also supports collaborative writing, which lets users create notes and then open permission for your team to jump in and help edit or rewrite. 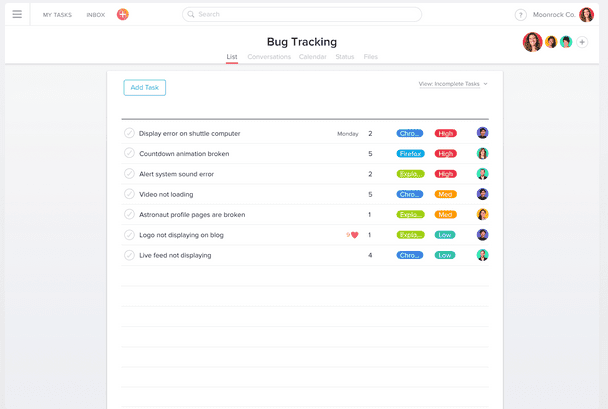 Everything is saved in real-time, and just like the powerful task management reporting, you can view a full audit log of changes. Oh and Active.Collab also includes an invoicing option to help track payments. This could be helpful for tracking expenses per each project. So while Active.Collab positions themselves as the simple solution, that may not be so true when compared to BaseCamp. But Active.Collab can easily be seen as the simplest alternative on our list, one that adds the extra features teams need without cluttering. With such a strong focus on the fiscal side, Mavenlink has a strong toolset for resource and cost management. Mavenlink helps provide teams the full picture with a real-time view into what your entire team is working on at any given time. This macro view, what Mavenlink calls Resource Management, can be focused into a micro view to look at specific tasks, but the power comes from understanding where your resources are, where they could go, and where they need to go. This helps teams plan beyond more than just individual tasks, but also if they need to grow and expand, or maybe even shrink and regroup their focus. But when it comes to Project Management, Mavenlink has a bit of a more complicated approach. That’s not to say its bad, because for some teams this could be the holy grail. But I will say it makes Mavenlink more dense, and powerful than other solutions. 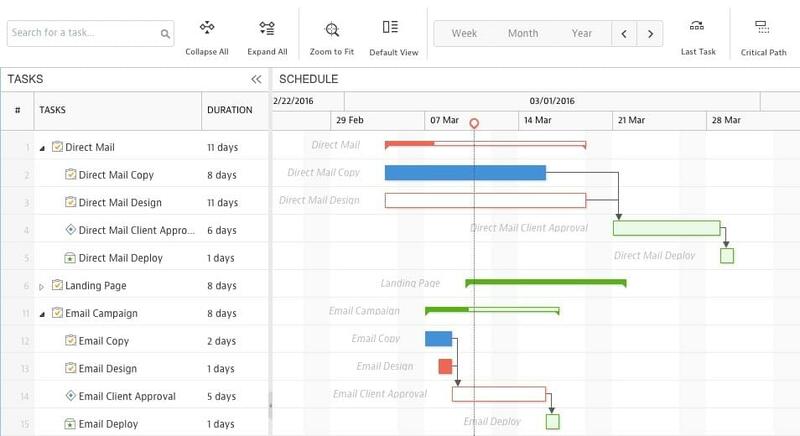 Teams can build out massive project plans with more Gantt charts to visualize and schedule. But users can also create assignments, tasks, milestones, and deliverables. This can be organized into a breakdown structure, somewhat like a list but with clear status, assignee, and start and end time signifiers. If working from scratch seems too complex, Mavenlink also lets you create project templates to reuse. Beyond its intense management, Mavenlink hosts some team collaboration features as well with a dedicated central dashboard for your projects, tasks due, activity feed and company directory. Users can share files, communicate and co-edit documents together right in the app. Taking a different approach, Podio seems to focus on the social and transparent lens for collaborating and managing our projects. The idea of Podio is making everything easy to find, easy to read, easy to share, and easy to act on. 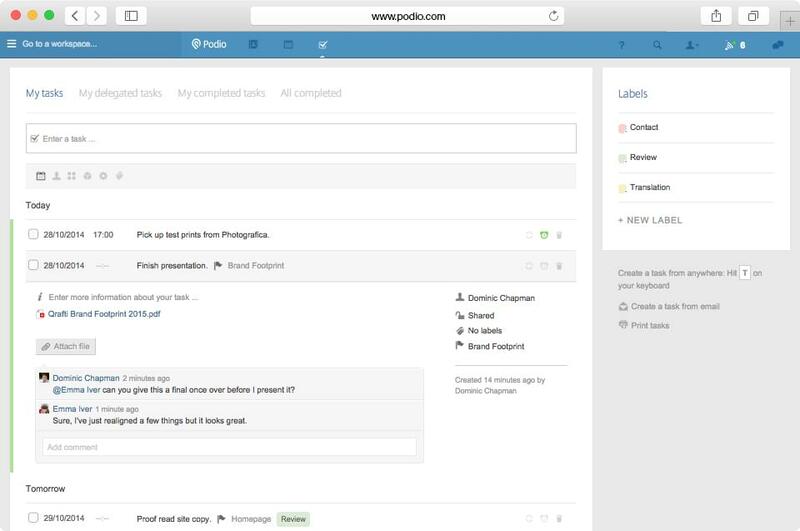 Podio allows users to create large projects, and break down those projects into individual tasks and workflows. Of course users can assign tasks to each other, share files, and discuss in comments on the task. But something really unique, those workflows we mentioned. 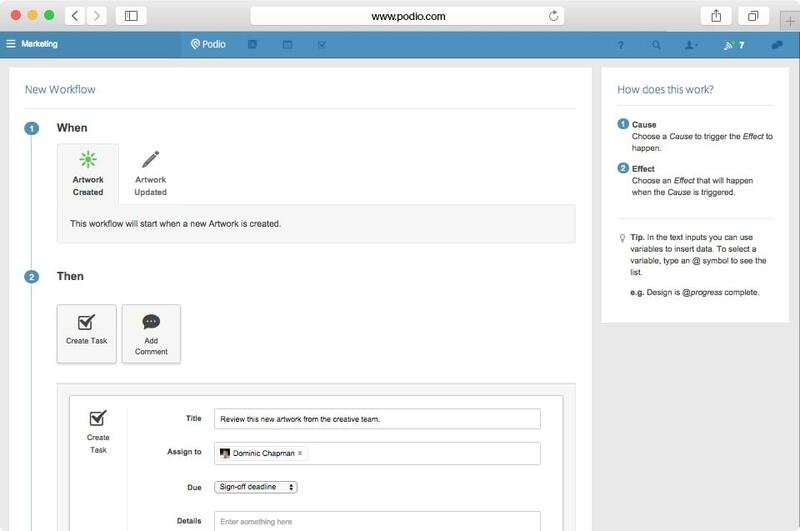 Podio tasks are designed to be “integrated with all work on Podio,” and they can even be automated right on Podio. The example Podio provides is one of managing a design project. Adding a Podio workflow to this project will create a task for the manager to approve the designs as soon as they have been uploaded by your team. The whole goal is to foster sharing and collaboration, beyond simple in-line comments or a check off on completion. The whole platform is flexible, and workflows or templates can be changed on the fly to fit the way your team works. When it comes to reporting, Podio has you covered as well – teams can visualize work in tables or cards for that visual edge. Users can display reports of their sales pipeline, project budgets, or the time remaining on open projects to name a few. But what if you’ve made it through our entire list, and still haven’t found a solution that seems right for your team? After all, the benefit of Basecamp is its simplicity, and its laser focus on removing clutter. Its completely possible that your team doesn’t want all those flash calendars, chatting functions, editing and collaboration tools, and complex tables or charts. If all your team needs is a better version of Basecamp and not all the bells and whistles, then Teamwork Projects might do the job. It checks the right boxes, with a simple task focused interface. Everything is still list based, but with powerful permissions options you can limit who sees what, tasks can be broken down into subtasks or linked into dependencies. For example, task A is dependent on other tasks B and C, A cannot be completed until B and C are. On top of that, Teamwork Projects has the time estimate and tracking tools missing from Basecamp, and an overall main dashboard provides all this information at a glance. There is an included Gantt chart view, but it’s an alternative — although interesting that it works in real time, edit something on the chart and your list is edited as well. There’s also a calendar function to stay organized, like most other solutions as well, so another point over Basecamp there. Messaging exist as well, but seem to be in-line style like Basecamp. Overall, Teamwork Projects expands on Basecamp’s web based platform, adds in a few more features if you want them, but provides a basic solution with the right features. There’s also a good collaboration and task management software, Deskun. You can manage all the projects and set tasks inside Gmail interface. Huh, what do yah know! That’s a really interesting solution. Thanks for bringing it to my attention, hopefully we can incorporate Deskun into a future post to compare similar solutions. You didn’t include best free integrated collaboration platforms, like Bitrix24. Sure you can use Slack AND Basecamp AND Dropbox and pay for each, but it’s better to use something that has all those tools in one place for free. Bitrix24 and its clones are awesome. Asana, Trello and others don’t have Gantt chart, task dependencies and other critical PM tools.